Andrew Marr's The Real Elizabeth (Henry Holt: $32.00) starts off rather slowly as an "intimate biography." I was concerned by the number of genealogical mistakes, but this book is not a royal genealogy. It is difficult for journalists like Marr to worry about grappling with little things, when the focus is more about the 60 years of Queen Elizabeth's reign. Marr works his way through the 60 years: from the young Queen, finding her way and her role to the doyenne of her family, the country and the Commonwealth. There is much sympathy for the Queen with the issues of her former daughters-in-law, for example. There is mention of abdication, but Marr omits one salient fact: a sovereign cannot abdicate without an Act of Parliament. The Real Elizabeth is a competent, thought-provoking look at the reign of the a very respected sovereign. Marr is right: Britain is very lucky to have her. The Scandalous Mrs. Blackford and White Nights are historical novels. Some weeks ago, I received an email from Eva McDonald, the co-author of Fanny Lear Love and Scandal in Tsarist Russia, asking me if I was interested in reading the book. She had read a post in Royal Musings about Grand Duke Nicholas Constantinovich, who was exiled to Uzbekistan, following the end of his relationship with American Harriet Blackford, who was also known as Fanny Lear. I responded positively, and I soon received a copy of the book. Harriet Clarissima Ely was born in 1848 in Philadelphia. According to the authors, she was a "strong, independent minded woman who refused to accept 19th century women's lack of freedom." At the age of sixteen, she married Beate Blackford. A year after the marriage, Harriet gave birth to the couple's only child, Caroline Holmes Ely Blackford. Blackford, who worked as a railroad conductor, had a serious drinking problem, and died shortly after the birth of Caroline. Harriet soon moved into a new realm, as she used her beauty and sophistication led her to pursue wealth through largely shady means. She soon moved to London, where she could travel to Paris. 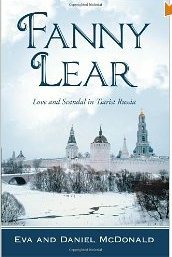 In 1875, she wrote her memoirs, Fanny Lear The Romance of an American in Russia. This book was published in French, and never translated into English until the McDonald's tackled the task. The translation forms the basis of their new book. She was more than happy to write about how she met Grand Duke Nicholas and how she became his mistress, and all that followed. Nicholas was not the brightest member of the Romanov family, which is not saying much as few of the members of the Russian Imperial family were not known for their intellectual capabilities. Grand Duke Nicholas followed his own drummer. He claimed to love Hattie, but his family were certainly not going to allow an American courtesan to become the wife of a Grand Duke. Nicholas was devoted to Hattie, calling her his little wife. But it was not meant to be. The Secret Police were also determined to keep them apart. Both were arrested, and Nicholas exiled. Hattie was asked to leave the country. The story of Nicholas's arrest and Hattie's deportation made the front pages throughout Europe. Scandals involving royals sell papers. After Hattie returned to Paris, she sat down and wrote her memoirs, which caused more consternation and more scandal. Nicholas lived in exile in Tashkent until his death in 1918. He married morganatically and had issue by his wives and mistresses. Hattie died in a non-descript house in Nice in 1888. I enjoyed Fanny Lear, but not without reservation. The authors have done a fine job in translating Hattie's book. They have also included contemporary documents from the National Archives. The book includes portraits of Hattie and Nicholas. But what is lacking from this book is scholarship. The McDonalds are good story tellers, but they have erred by not combing through Hattie's own words and providing footnotes to describe the whos, the whats and the wheres. I know a lot about royalty so I was able to figure out who Hattie was talking about. She writes about watching from the gallery the arrival of the guests to attend the wedding of Grand Duchess Marie. It took me a few minutes to realize she was writing about Grand Duchess Marie Alexandrovna, only daughter of Alexander II, who was marrying Queen Victoria's second son, Prince Alfred, Duke of Edinburgh. and then there is the question of Hattie's daughter, Caroline. The McDonalds do not tell us what happened to her. Hattie gives birth, husband dies, she uses her beauty and wiles to make money, ends up in Russia as the mistress of a Grand Duke and dies in Nice ... but whatever happened to Caroline? Fanny Lear Love and Scandal is Tsarist Russia is a definite addition to any decent Romanov collection. The book was published by IUniverse ($32.95).